Land has 2 twin villas , each with its own exclusive pool and bbq , as well as with exclusive garden,so privacy is guaranteed . Each villa is fully equipped and furnished. Each room is air conditioned for summer, with central heating and fire place for winter . Stone patio surrounding and spot lights make our villa look as a 'château' using the terms of a recent French client. It consists of 750 m² surrounding for each villa, wonderful garden all around that guarantee privacy for guests of both villas. Kitchen area in the BBQ zone. Private parking outside the villa. Owners are proud to offer personalize service and honoured to receive bookings from same clients despite the fact that villa is not even 3 years old. 2 master bedrooms with one double bed and one single each . Studio below villa linked with external steps and not communicating with villa but the same building forming a 3 level one . Studio ( basement level ) is a self catered one , with one double bed , a room with an extra double sofa with kitchen corner and one third bathroom. This incrases capacity of villa to maximum 8 persons. Il s'agit de 2 maisons et de 2 piscines sur un jolie terrain tres bien place. Helen est extremement sympatique et parle toutes les langues! La maison est tres bien equipe et d'un standard superieur. il faut savoir que ce sont 2 maisons cote a cote donc il vaut mieux tomber sur des voisins sympas ou louer la totalite. Nous etions tres bien tombe. Lefkada est pour moi le plus beau coin de Grece, les plages que l'on peut y trouver sont merveilleuses. Located at the foot of a lush green valley but at only 3 min from Agios Nikitas & Kathisma beaches and villages, north western side of Lefkada. Away from noise and very close to all amenities. 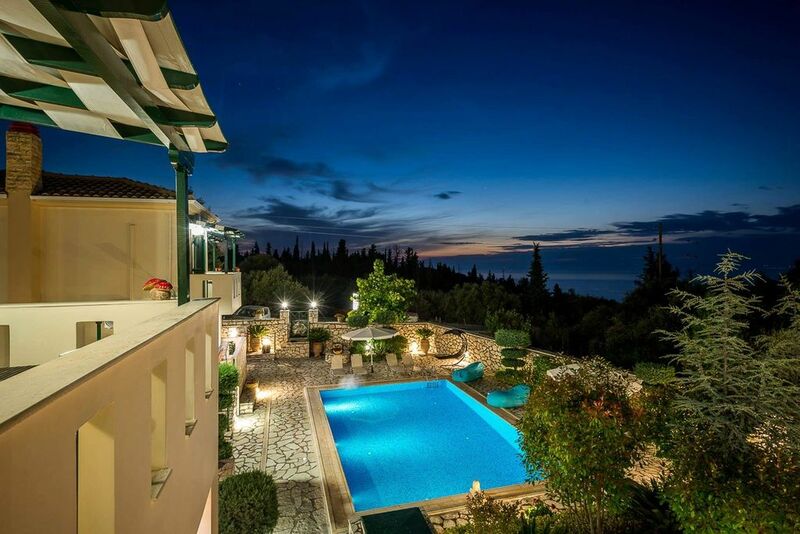 Fully equiped and furnished villas,max capacity 6-8 persons,both villas figur view to the Ionian Sea and to the pools . Porto Katsiki, the internationally awarded beach, the fabulous beaches of Egremni, Mikros Gyalos are at only 20 min. Special offers for May , second half of September and October.